During these events, astrophotographers from around the world all run to their telescopes, each attempting to snap their own perfect moment of beauty. How exactly does it all work? The answer is a combination of position and refraction. Scientifically known as the “perigee-syzygy” moon, the supermoon is characterised by its unusually large size and brightness. It is the combination of two specific conditions. First, there must be a regular full moon, determined by the lunar cycle which typically runs between 29 to 30 days. Second, the moon must be at its absolute closest orbital position to the Earth, called a perigee. When both these conditions are met, the supermoon illuminates the sky with a perceived luminance far greater than usual; stargazers often described it as a bright lamp in the dark sky. This summer, the supermoon came out on August 10th. The next opportunity is coming up on the eve of September 9th. If you make any plans that night, make sure you have a view of the sky. 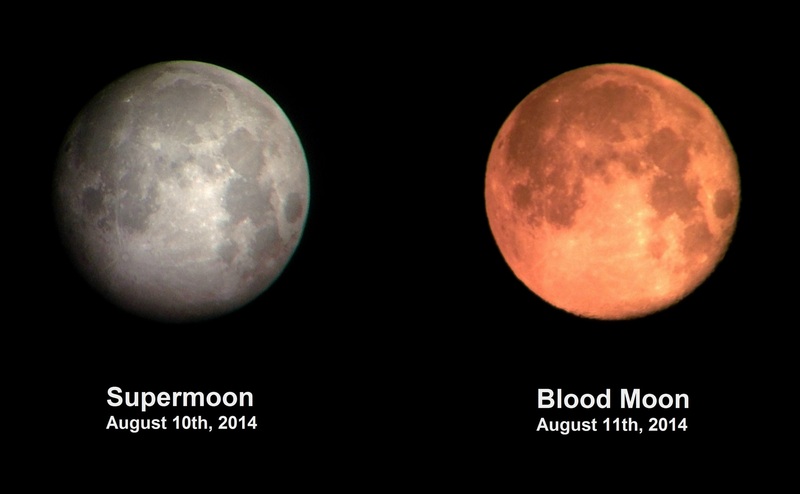 With its orange-red tint and peculiar look, the blood moon can be observed in two different instances. The first is at sunset, when the moon is still rising and is near the line of horizon. The second, which is far less common, is during what is known as a lunar eclipse. Indeed, the blood moon actually appears most vividly when the Moon, Earth, and Sun are almost perfectly aligned with each other. The defining feature, its unusual colour, is a product of refraction. As sunlight reaching the moon inevitably passes through a dense layer of the Earth’s atmosphere, light is scattered. Shorter wavelengths, which are more likely to be scattered by air molecules, leave their place to the longer wavelengths. Thus, red and orange, the two colours with the longest wavelengths of the visible spectrum of light, form the tint of a blood moon. Unlike a solar eclipse, a lunar eclipse can be seen from just about anywhere on Earth at night, can last around 10 times longer, and does not require any protective eyewear such as sunglasses. In fact, it is even dimmer than a regular full moon! In related news, the Perseid meteor showers take place on the nights of August 12th and 13th and peak between 2 and 4 AM. Mark your calendars, and enjoy the show.